Creativity. Innovation. Authenticity. Collaboration. Reflection. 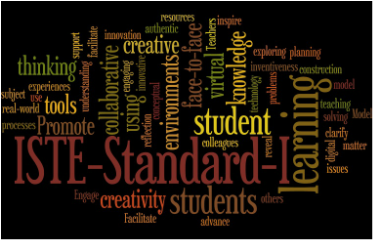 To me, these five words are the hea﻿rt and soul of the first ISTE Teacher standards, standards which are numbered and, by virtue of numbering, have a suggested priority indicating that--perhaps--this first standard should be the primary or foundation standard. As a teacher, the first benchmark in this standard is the one on which I have always tried to build my teaching approach; even before the ISTE standards were first developed in 1998. As a veteran teacher of high school computer courses, I have always used the most current digital tools at my disposal so that my students could approach project-based assignments in as real-world setting as I could manage. The Master of Science in Instructional Technology program at The University of Southern Mississippi has introduced me to many new and exciting tools that I might use to facilitate an even closer alignment to ISTE Standard I for my students. Some of these tools have been commercially produced software such as Adobe's Creative Suite, including Photoshop, InDesign, and Dreamweaver, while others have been free (or free to try) Web-based tools such as Pixler, Emaze, and Weebly. Not all of the tools I have tried in this program are available to me in my classroom, due to budgetary and fiduciary issues, but with each new tool, my abilities have been honed and I have taken something from the experience that I can use with my classes. The next section contains icons for five artifacts linking to works I created and/or participated in the creation of and which I believe are superior examples of just what this standard defines. You may click on any image to have that artifact open in a new window. In the list below I have justified my choices and you may click on the heading for each to open the artifact in a new window; any words shown in bold will open a web﻿site relating to that item in a new window. IT567 Flyer (Creati﻿vity): One of the assignments for the IT567 Digital Publishing & Visual Design was to create a flyer. 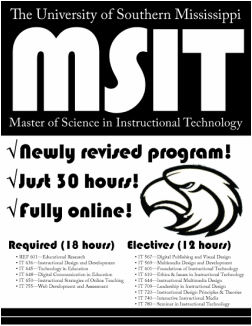 I was given the choice of subject matter and opted to create a flyer that might be used to recruit for the MSIT program at USM. I went through numerous revisions of this flyer before achieving a result that demonstrated my creativity as well as met the criteria for good design that I had learned in the class. Click on the image to see the flyer pdf document, which will open in a separate window. IT645 Google Form (Authenticity): ISTE-SI.2 requires authentic, real-world application projects. As a teacher of technology, learning what technologies are available to my students once they leave my classroom is very important. An assignment for IT645 Computers in Education required I use Google Forms to create an interactive form, so I created a technology survey to use with my classes. This tool could also be used to create assessments. 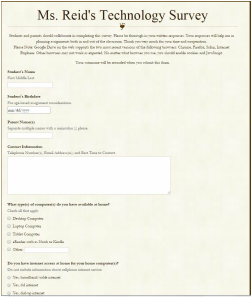 Click on the image to be taken to the live form, which will open in a separate window. REF601 Research Survey (Collaboration): Nearly all assignments for the required REF601 Educational Research: Interpretations and Applications were steps in the active research process. 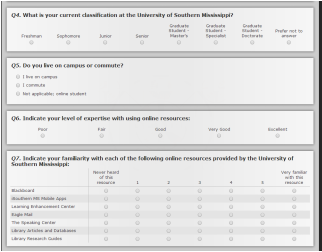 While my final submission was completed individually, all steps up to my final paper submission were completed collaboratively as part of a research team, including the Research Survey form shown here. We used Qualtrics survey software to deliver the survey instrument, so the document you will see is a pdf of the questionnaire. Click on the image to open the document in a separate window. 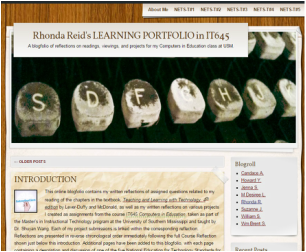 IT645 Learning Blogfolio (Reflection): Each of the courses I have taken as part of the MSIT program at USM has had a reflections component, incuding IT645 Computers in Education. As part of the class, I created a blogfolio where I reflected on each assignment completed and received feedback and commentary from my fellow students. 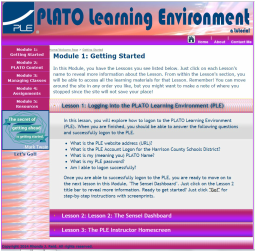 K-12 education requires care when using a learning tool such as this due to student ages, but such a web tool is an excellent device for higher order learning.Click on the image to be taken to the website, which will open in a separate window. The tools and practices I have learned through the MSIT program have made--and I believe will continue to made--me a better teacher. I will continue to expand upon my knowledge of new technologies and methodologies so as to continue growing as an instructor. For example, my next educational endeavor will be an online course on using the Canvass Learning Management System software; this course is required by the Mississippi Department of Education for partial fulfillment of requirements to upgrade my teaching license endorsements. Once I complete the course, I will be assigned a Canvas shell and will be able to use the LMS with my own classes. I am very excited about the opportunity.